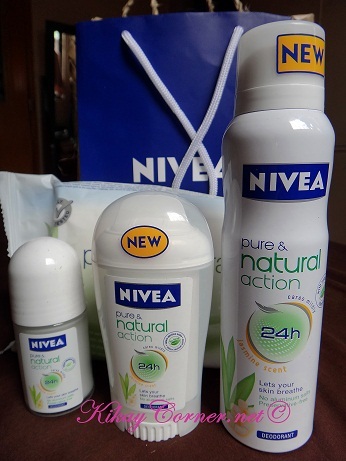 When the Nivea Pure and Natural line arrived at my doorstep a few weeks before we left for Bohol, I did not quite expect anything special about it, really. What could be so special about deodorants anyway, right? I quickly threw one of the bottles in our luggage and thought I’d try it when I get to our getaway place. In all my years, I still have not found a deo that I can consider a favorite. Most that are available in the market are powder scented, if not, too floral. Both of which my olfactory sense don’t approve of. NIVEA Pure & Natural products use gentle and pure ingredients that respect your skin’s nature so you don’t have to worry about sensitivity problems and irritations that are known to be associated with some artificial and chemical ingredients. Definitely, my current deodorant of choice! The Nivea Pure & Natural range is suitable for all skin types even to extra sensitive skin.